Summer is in full swing and, guys, I know you need a good beach read. Am I right? You might actually need more than one because, if you're anything like me, you're going to sail through Emily Giffin's latest novel First Comes Love in less than two days. I swear, her books just keep getting better and better. I have to note that this novel first delighted me on a kind of superficial level because it's set in Atlanta, and I happen to be an Atlantan. I love my city, and although I spend far less time in Buckhead than Emily's characters do, she did a beautiful job of showcasing the city. Some of my favorite restaurants are mentioned and having the novel take place where I live helped me get a stronger grasp on the setting, which is always a bonus. That being said, Emily surprised me with this one. I watched an interview with her recently where she said her characters are growing along with her, and that their struggles are becoming more and more complex. With each and every book she releases, Emily has progressively moved away from light-hearted chick lit and into the here and now, where her stories are straight-up messy, complex, and full of the intensity that real life and real families bring. 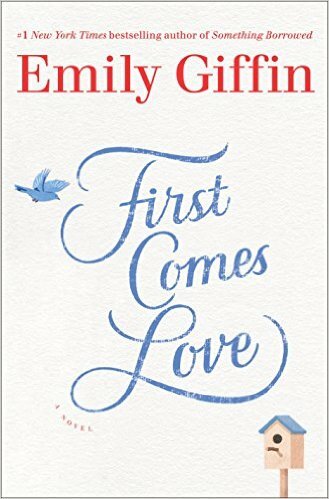 First Comes Love does not tie things up into a pretty bow, although it certainly left me feeling satisfied - if unsettled - and proud(er) to have followed along with Emily's writing journey all these years. She is a damn fine storyteller. Neither Josie nor Meredith is a very likeable character. In fact, they both showcase some of the uglier parts of myself and there was more than one moment during my reading when I had to stop and digest the story. But what Emily does so beautifully with these sisters is make me root for them, even while I disapprove of their actions or motives. Josie and Meredith are bitter and angry, sometimes for what seems like made-up reasons or even no reason at all, and the undercurrent of loss that flows through the book is what has the biggest impact on their relationship. They've spent over a decade of their lives making choices that reflect the pain of losing their brother. And isn't that what we do? We hold on to what is gone and think, somehow, we can change it all by reliving it over and over? Emily shows us that this is not the way to go. But, like Josie and Meredith, we all have to figure that out for ourselves. First Comes Love is a tale of two sisters that had me thinking of my own siblings, and realizing that the stuff between families that's never fully settled is just a natural, and perhaps necessary, part of living and loving. For anyone who picks up Emily Giffin's latest thinking (because of the title or cover) that it's going to be reminiscent of Something Borrowed or Something Blue, they might be disappointed. First Comes Love is not that kind of book. If you want to learn more about Emily Giffin or her fabulous novels, please visit her official website here. You can also like her on Facebook or follow her on Twitter and Instagram @EmilyGiffin and @EmilyGiffinAuthor. Please note, I received a free copy of First Comes Love in exchange for an honest review.